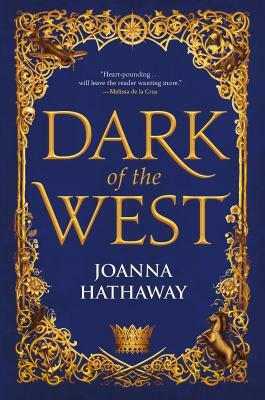 Teens meet to discuss Joanna Hathaway's YA fantasy debut Dark of the West. Aurelia Isendare is a princess of a small kingdom in the North, raised in privilege but shielded from politics as her brother prepares to step up to the throne. Halfway around the world, Athan Dakar, the youngest son of a ruthless general, is a fighter pilot longing for a life away from the front lines. When Athan's mother is shot and killed, his father is convinced it's the work of his old rival, the Queen of Etania—Aurelia's mother. Determined to avenge his wife's murder, he devises a plot to overthrow the Queen, a plot which sends Athan undercover to Etania to gain intel from her children. Athan's mission becomes complicated when he finds himself falling for the girl he's been tasked with spying upon. Aurelia feels the same attraction, all the while desperately seeking to stop the war threatening to break between the Southern territory and the old Northern kingdoms that control it—a war in which Athan's father is determined to play a role. As diplomatic ties manage to just barely hold, the two teens struggle to remain loyal to their families and each other as they learn that war is not as black and white as they've been raised to believe.